This Emerson / Viewsonics Product is a Quality Indoor/Outdoor 2-Way Services 15 dB Gain Amplifier and is used by Comcast and other Cable TV companies in Installations of HD and Broadband Internet Services. The new VSMA-601C Mini Drop Amplifier from Viewsonics is a full-featured drop amplifier in a space-saving, compact design. 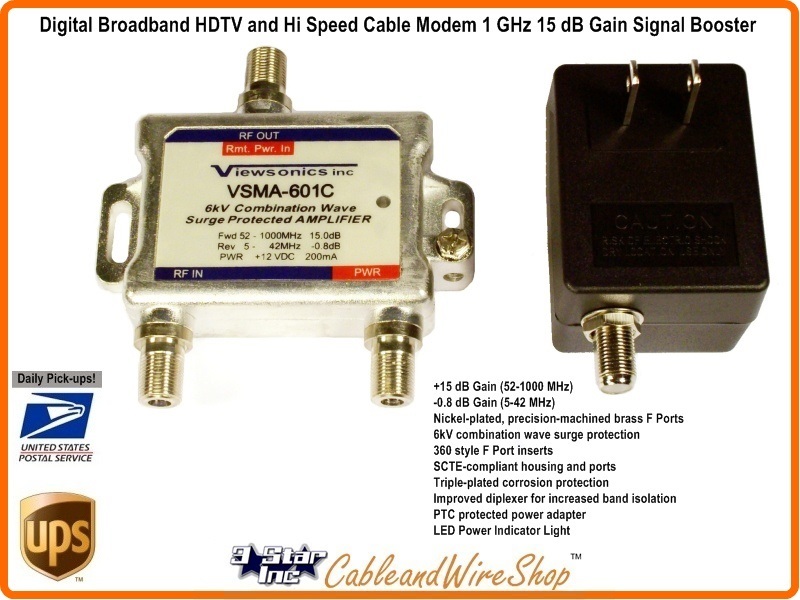 The VSMA601C is only half the size of prior designs while providing the features required for expanded Broadband services. It is 2-Way Services capable for PPV Programs and High Speed Internet connection to the Cable TV Modem. Install this Amplifier Inside or Out, comes with a Power Supply, but get an Optional Power Inserter for even more flexibility (Not included), each featuring F Port connections to facilitate multiple installation options using the same RG6 cable used in the Cable TV Install (See "Install Guide" below). Install this Amplifier before the Splitter That feeds to multiple TV set locations as to ngate the loss of signal. The VSMA601C features include 6kV combination wave surge protection on the RF input port and 6kV ring wave surge protection on RF output/remote power port. This is the highest level of surge protection available and meets the requirements of IEEE C62.41-1991 Cat. B3 and A3. All F ports are nickel-plated, precision-machined brass with 360 style F Port inserts and meet the requirements of ANSI/SCTE 01-1996 (SCTE SP-400). All ports are hermetically sealed to withstand 30psi of pressure for 60 seconds. The zinc die cast housing is triple plated for maximum corrosion resistance, even in the harshest environment. The VSMA601C is powered by a low noise GaAs MMIC that provides consistent downstream gain over the life of the amplifier. The internal diplexer provides a full 52-1000MHz amplifier forward band and a true 5-42 MHz passive return band. All 600C series amplifiers can be powered by our 110VAC/12VDC power adaptor directly or with an optional power inserter. The power adaptor is manufactured with PTC technology or over current protection and has 6kV surge protection on the AC input port. Note: Too many times, you're stuck trying to fix the no man's land between your Home wiring, and the Cable TV Company Feed from the Pole or Pedestal. Old Installation cable and years of Up-Grades, Additional Outlets, Changes, Modems and High Definition leaves you with a distribution system beyond what was originally envisioned. The Cable TV Company will be happy to Charge you to go through and Re-Install your Home, or you can do it yourself! With HD Digital Signals, the Signal Level is actually lower than the analog, and with increased Channel Capacity, not enough is there to feed your Home. Check Your Picture quality where the Cable TV feed enters your Home, if it's good there, you can replace connectors, cable and Splitter to bring your installation up to the newest specifications. If you are feeding numerous TV sets, Cable Modem and/or long Distances, use this Amplifier before the Splitter To maintain Signal Quality. What's nice about an Indoor/Outdoor Inline amplifier is you can put it in anywhere, and move it to anywhere else later! Just use a Barrel Connector (F-81) or short jumper to reconnect the cables together in absence of the Amplifier you removed. If the Picture quality is Poor at the Feed point of your House (the Cable Company usually has a Grey box used as a Demarcation Point for this Purpose), call your Cable TV Technician and Demonstrate to him your issues, so he can effect repair.